Hamas member Salah Bardawil says agreement on PA elections is vague and meaningless. 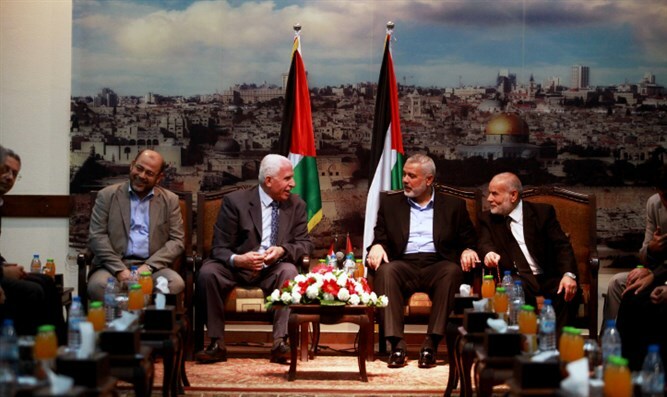 Salah Bardawil, a member of Hamas’s political bureau, expressed disappointment on Wednesday with the results of the Fatah-Hamas reconciliation talks held in Cairo in recent days. The talks, attended by leading Palestinian Authority (PA) political factions, ended in an agreement to hold new elections by the end of 2018. If held, the new elections would be the first in the PA in over a decade. The factions called on the electoral commission to prepare for the presidential and legislative polls and also asked PA chairman Mahmoud Abbas to set a date for them after consulting with all sides. He described the agreement as “meaningless and without real mechanisms for implementation. There is a vague joint declaration, but I find it difficult to see how we will succeed in bringing it into expression on the ground." Bardawil accused Fatah representatives of backing down from commitments in previous summits, leading to the current situation. "The American pressure and the threats from Israel adversely affected the Palestinian Authority during the talks," he charged. The talks in Cairo were based on the general understandings reached in October between the two organizations, in the wake of which Hamas dismantled the Gaza Executive Committee and allowed the Palestinian Authority (PA) government in Ramallah to receive authority over Gaza. The PA has since assumed control of Gaza’s border crossings but there are still disagreements, particularly over the fate of Hamas's armed wing. Abbas has demanded that the armed militias in Gaza disarm as part of the implementation of the agreement. Hamas rejects the demand.